"When we started this, we just wanted to do things differently and give kids a different option," Humphreys said. "I just wanted them playing football, no matter where it was. What I never realized is that some of the the biggest holes we're filling are in these surrounding counties." For youth football teams in other counties, Humphreys noted, consistency has been an issue. It's not uncommon for teams to drive more than an hour to play, only for their opponents to compete at a different age level or sometimes not even show up at all. By joining the league, every team will have a set schedule of opponents and regular guidelines across the board. Each squad will also receive uniforms, equipment and other amenities already available to KFL teams. "We're kind of becoming our own 3rd Region," Humphreys said. "It's been a very busy, very active, but productive offseason." 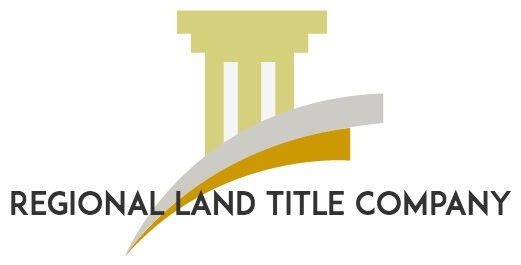 The option for expansion into other nearby counties is always open, as well. "The extra work doesn't bother us," Humphreys said. "It's about if we can continue at the same level. As long as we can continue to offer what we feel like is an excellent league and everything we offer with academics, character lessons and athletics -- if we can keep doing that, then we'll continue to add to it." KFL has also added a new Rookie Tackle division, in an attempt to help "bridge the gap" between flag and tackle football. The flag football division is for 5-8-year-olds, while tackle football is for third-through-sixth grades. The Rookie division will be available for first-and-second-graders who want to move out of flag but may not be quite ready for full 11-on-11 contact. Instead, the Rookie division will be played on a smaller field with less players -- eight against eight -- so younger participants can learn the game at a more suitable pace. "As far as I know, we'll be running the only one in western Kentucky and southern Indiana," Humphreys said. Humphreys worked closely with former Marshall University and NFL quarterback Chad Pennington to help develop the Rookie Tackle program, which Pennington helped implement in a league in central Kentucky. "This allows the kids to actually learn plays and get more exercise, too," Humphreys said. "What they did in Chad's league last year was they put little GPS monitors on the kids to track their movement from a physical fitness standpoint. "What they found out was the kids who played Rookie Tackle were 48 percent more active than kids who played 11-on-11. There are less kids out there and more of them are moving." From a participation standpoint, KFL officials also believe it will provide another avenue for kids to join the sport. "I really feel like it's going to be a lot of fun," Humphreys said. "I think the kids will like it. If there are kids out there who are missing out, we're trying to give them another place to make football available to play." 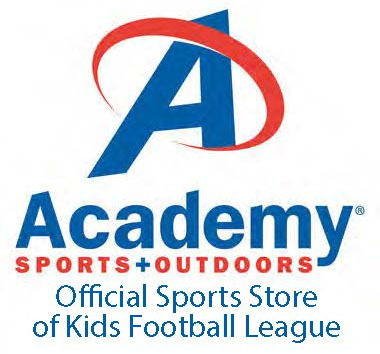 KFL registration is now open through the league's web site at kidsfootballleague.com or through live registration at Academy Sports on July 7-8. Findings In this cohort study using data from the Wisconsin Longitudinal Study among men graduating high school in Wisconsin in 1957, there was no statistically or clinically significant harmful association between playing football in high school and increased cognitive impairment or depression later in life, on average. Meaning For men who attended high school in the late 1950s, playing high school football did not appear to be a major risk factor for later-life cognitive impairment or depression; for current athletes, this study provides information on the risk of playing sports today that have a similar head trauma exposure risk as high school football played in the 1950s. Importance American football is the largest participation sport in US high schools and is a leading cause of concussion among adolescents. Little is known about the long-term cognitive and mental health consequences of exposure to football-related head trauma at the high school level. Objective To estimate the association of playing high school football with cognitive impairment and depression at 65 years of age. Design, Setting, and Participants A representative sample of male high school students who graduated from high school in Wisconsin in 1957 was studied. In this cohort study using data from the Wisconsin Longitudinal Study, football players were matched between March 1 and July 1, 2017, with controls along several baseline covariates such as adolescent IQ, family background, and educational level. For robustness, 3 versions of the control condition were considered: all controls, those who played a noncollision sport, and those who did not play any sport. Exposures Athletic participation in high school football. Main Outcomes and Measures A composite cognition measure of verbal fluency and memory and attention constructed from results of cognitive assessments administered at 65 years of age. A modified Center for Epidemiological Studiesâ€™ Depression Scale score was used to measure depression. Secondary outcomes include results of individual cognitive tests, anger, anxiety, hostility, and heavy use of alcohol. Results Among the 3904 men (mean [SD] age, 64.4 [0.8] years at time of primary outcome measurement) in the study, after matching and model-based covariate adjustment, compared with each control condition, there was no statistically significant harmful association of playing football with a reduced composite cognition score (â€“0.04 reduction in cognition vs all controls; 97.5% CI, â€“0.14 to 0.05) or an increased modified Center for Epidemiological Studiesâ€™ Depression Scale depression score (â€“1.75 reduction vs all controls; 97.5% CI, â€“3.24 to â€“0.26). After adjustment for multiple testing, playing football did not have a significant adverse association with any of the secondary outcomes, such as the likelihood of heavy alcohol use at 65 years of age (odds ratio, 0.68; 95% CI, 0.32-1.43). Conclusions and Relevance Cognitive and depression outcomes later in life were found to be similar for high school football players and their nonplaying counterparts from mid-1950s in Wisconsin. The risks of playing football today might be different than in the 1950s, but for current athletes, this study provides information on the risk of playing sports today that have a similar risk of head trauma as high school football played in the 1950s. When Todd Humphreys received the call from Tommy Barton in March, he instantly recognized a win/win opportunity. Humphreys is the president and a co-founder of the KFL (Kids Football League), an Owensboro youth sports organization created in 2013 with a host of new ideas and a progressive mindset. The relatively new league’s organization and success hasn’t gone unnoticed. As the Greater Muhlenberg Parks and Recreation Executive Director, Barton is responsible for organizing youth sports programs. With a population of about 30,000 residents, Muhlenberg County struggles to field enough players for an entire football league, but can easily fill a team or two in each division. In the past, Muhlenberg traveled to various Kentucky sites for one game matches or tournaments. Without league structure, each location was governed under different rules and age breakdowns. “Nothing was consistent,” Barton explained, “and communication was often an issue”. By joining KFL Barton believes his Muhlenberg County players and families will enjoy not only consistency, but also the high ideals the league strives to achieve. “All sports leagues reward athletic achievement, but KFL also rewards character and academic excellence,” Barton said. 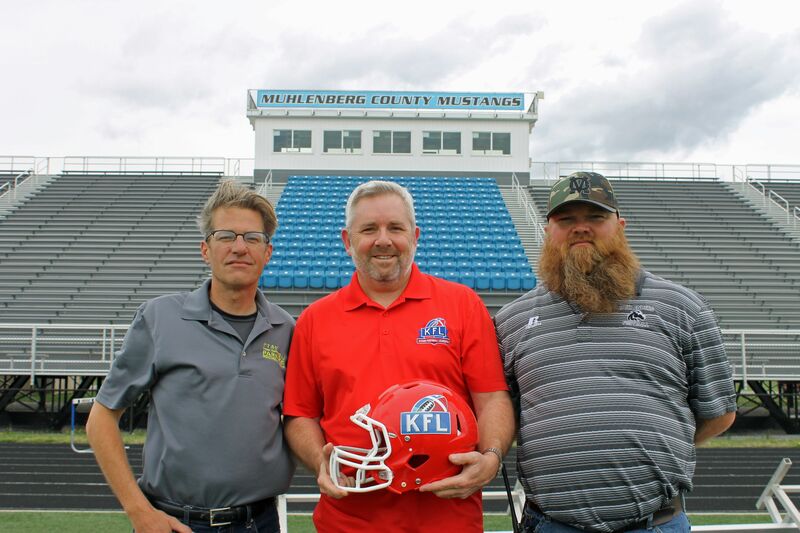 Rather than playing all their league games at a single location, KFL’s approach is to rotate around various area high school and middle school football fields each weekend introducing players and fans to most of the area venues. Providing another win/win partnership, these KFL games offer the host site a fundraising opportunity for their boosters through concession sales. Muhlenberg hopes to add one team to KFL’s 5th and 6th Grade Tackle Division and possibly two teams to the league’s 3rd and 4th Grade Tackle Division in 2017. More teams may be added to the 5&6 and 7&8 Year Old Flag Divisions in the future. Players may register today at KidsFootballLeague.com and enjoy an early bird rate discount. The most recent survey of youth sports shows football participation is growing faster than nearly every other sport. "You're seeing greater physical literacy in better youth football programs — programs that embrace coaching education and teach the sport smarter and safer," Sports & Fitness Industry Association President and CEO Tom Cove said in a statement released by USA Football. "In football and other sports, it will be interesting to learn if participation keeps rising as player safety continues to increase and the trend of higher standards in coaching education becomes the norm." USA Football is based in Indianapolis and has implemented the "Heads Up" coaching program to teach young players tackling fundamentals, which can help them avoid head injuries. "Football participation increases, even modest increases, may signal that medically endorsed programs, including our Heads Up Football program and practice guidelines, are making a positive difference," he said. "It's clear that coaching education — including concussion recognition and response, heat preparedness and sudden cardiac protocols — is improving and driving behavior change. 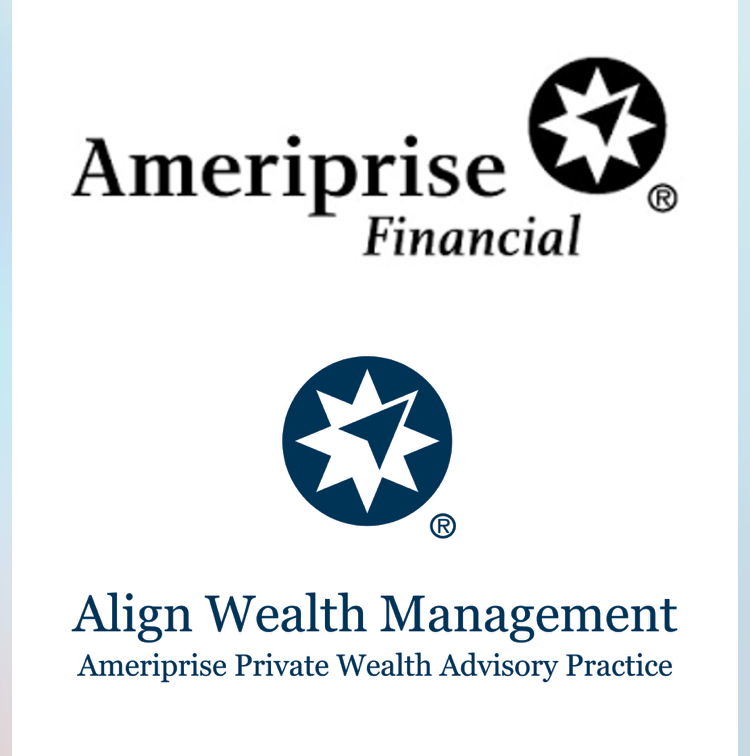 It's too early to tell if the latest participation increases are a trend." Concussions in sports are a growing issue as well as finding adequate ways to protect our children on the field. Whether a concussion results in severe damage or prevents an individual from playing the game they love, finding a safe solution is a necessity for athletic departments and organize sport organizations. The NFHS (National Federation of State High School Associations) recently published an article on the Top Ten Sports Law Issues Impacting School Athletics Programs regarding the topic of sport law topics and the legal claims the occur as a result. NFHS set the direction for sport and activity standards as well as rules for high school associations. On January 30, 2014, the governor of Mississippi signed into law the Mississippi Youth Concussion Act. All 50 states and the District of Columbia now have a sports concussion law in place. Most of the state laws contain three common tenets: 1) any athlete suspected of having sustained a concussion must immediately be removed from play; 2) the athlete may not be returned to action the same day; and 3) the athlete may be returned to action only after written clearance is provided by a licensed health-care professional (the definition of which varies widely from state-to-state). 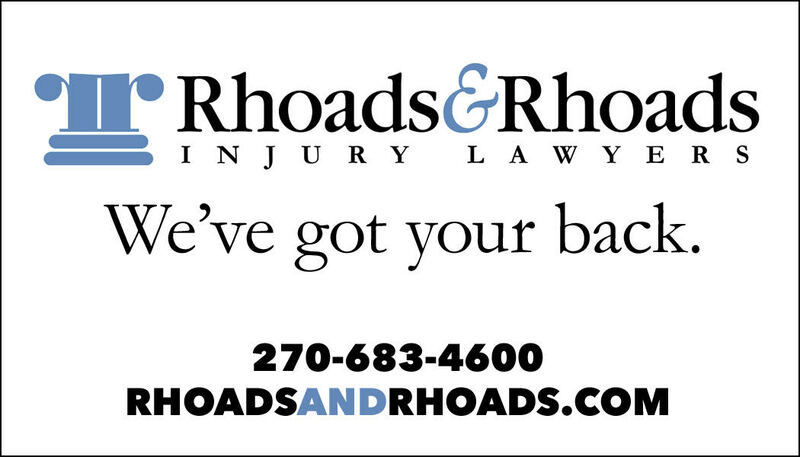 Since the mid-1990s, hundreds of civil suits per year have been filed by injured student-athletes against schools, administrators and athletics personnel, most asserting a negligent failure to exercise reasonable care to safeguard the health and well-being of the athlete. Out of these cases has emerged an extensive body of law focusing on the need for athletics personnel to understand the legal responsibilities imposed on them with regard to student-athletes, including the duties of planning, supervision, technique instruction, warnings, safe playing environment, safe equipment, matching and equating athletes, evaluation of injuries, return-to-action protocols, immediate medical response, emergency medical response planning, safe transportation, and other categories of responsibilities intended to protect athletes from injury. 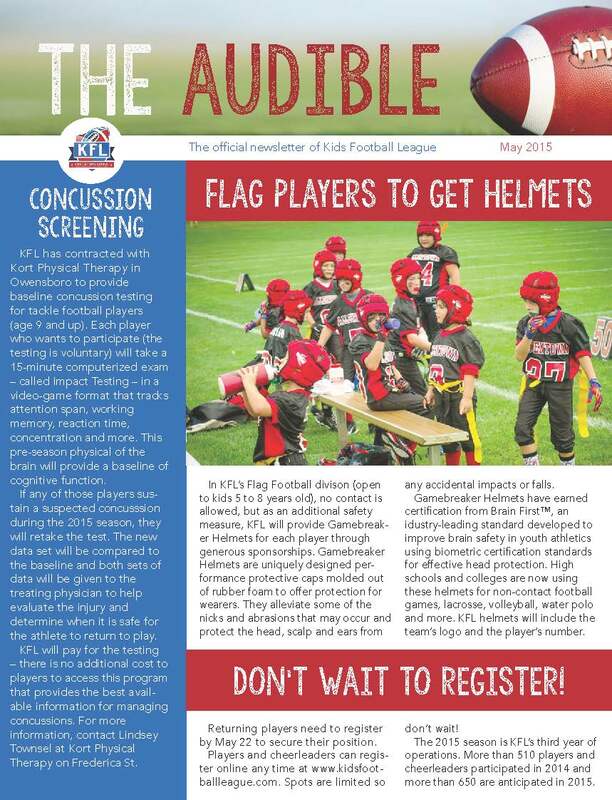 Kids Football League has committed to innovative new safety measures for the 2015 season, including baseline concussion testing and new flag football helmets. These initiatives are yet another way that KFL stays on the cutting edge of safety in its continuing mission of basing everything on what is best for the kids. KFL has contracted with Kort Physical Therapy in Owensboro to provide baseline concussion testing for tackle football players (age 9 and up). Each player who wants to participate (the testing is voluntary) will take a 15-minute computerized exam - called Impact Testing - in a video-game format that tracks attention span, working memory, reaction time, concentration and more. This pre-season physical of the brain will provide a baseline of cognitive function. If any of those players sustain a suspected concusssion during the 2015 season, they will retake the test. The new data set will be compared to the baseline and both sets of data will be given to the treating physician to help evaluate the injury and determine when it is safe for the athlete to return to play. KFL will pay for the testing - there is no additional cost to players to access this program that provides the best available information for managing concussions. For more information, contact Lindsey Townsel at Kort Physical Therapy on Frederica St. In KFL's Flag Football divison (open to kids 5 to 8 years old), no contact is allowed, but as an additional safety measure, KFL will provide Gamebreaker Helmets for each player through generous sponsorships. Gamebreaker Helmets are uniquely designed performance protective caps molded out of rubber foam to offer protection for wearers. They alleviate some of the nicks and abrasions that may occur and protect the head, scalp and ears from any accidental impacts or falls. Gamebreaker Helmets have earned certification from Brain First™, an idustry-leading standard developed to improve brain safety in youth athletics using biometric certification standards for effective head protection. High schools and colleges are now using these helmets for non-contact football games, lacrosse, volleyball, water polo and more. KFL helmets will include the team's logo and the player's number. The 2015 season is KFL's third year of operations. More than 510 players and cheerleaders participated in 2014 and more than 650 are anticipated in 2015. As part of KFL's commitment to safety, the league has certified more than 80 coaches in proper coaching methods through USA Football and the NFL Heads Up program. KFL was the first youth football league in the area to sign up for the NFL Heads Up program. 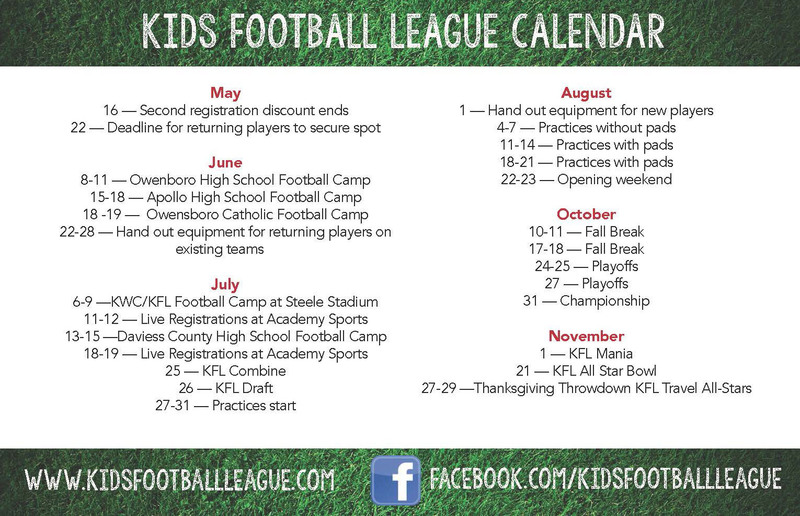 Players and cheerleaders can register for the 2015 season at www.kidsfootballleague.com. Check out the latest edition of the USA Football Newsletter! Does youth sports teach valuable life lessons, or is it a waste of time? Should we do away with keeping score in youth sports? Registration for the 2015 KFL season is now open! Returning players are guaranteed placement on a team if they register by May 22, 2015. To register online, click here. To print out a registration form and mail it in, click here. For KFL Football, please contact Todd Humphreys at hthumphreys17@gmail.com or call 270-929-1236. For KFL Cheer, please contact Christy Taylor at cchaney@glennfuneralhome.com or 270-570-3655.